There are lots of interesting people who live in the tri-city area. As a columnist, I am fortunate to meet many of them. In early January, I was having coffee with friends at J.C. Beans Coffee House on Pacific Coast Highway in Dana Point. They introduced me to their neighbor, Fahim, a regular customer there. Even though Fahim has lived in Dana Point for 28 years, I had never met him. As writers, we had much in common. He signed a copy of his 2012, memoir, Fahim Speaks, and handed it to me. I said, “It will be fun to learn about you.” He smiled. We promised to stay in touch. While reading each page of Fahim Speaks, I became more and more fascinated with this man’s life. As a young boy growing up in Kabul, Afghanistan, Fahim sometimes skipped school and went to the movies. His dream was to become an actor in Hollywood. In September 1983, Fahim’s father came home one day and said to him and his brother, “Pack your bag, we are leaving immediately.” The communist secret police, who occupied Afghanistan, were about to arrest his father. If that happened, Fahim and his brother would have been sent to an “indoctrination” camp in Russia. Fahim’s mother, two younger sisters and older brother had escaped four years earlier. Fahim guessed they had made it to America, but his family had not heard from them. The goal was to make it to Pakistan, and then, somehow, some day, get to the United States. Fahim’s book takes readers on that perilous and dangerous journey. The three family members made it safely to Pakistan, crossing the border by horseback over a freezing mountain pass. They applied with the American Embassy to go to America. After a four-year wait, one day they were summoned to the embassy. His mother and siblings had been located in Virginia. The family was reunited by telephone. Fahim said to his mother, “We are on our way to join you in America.” He was 18. After living in Virginia, the family moved to California. 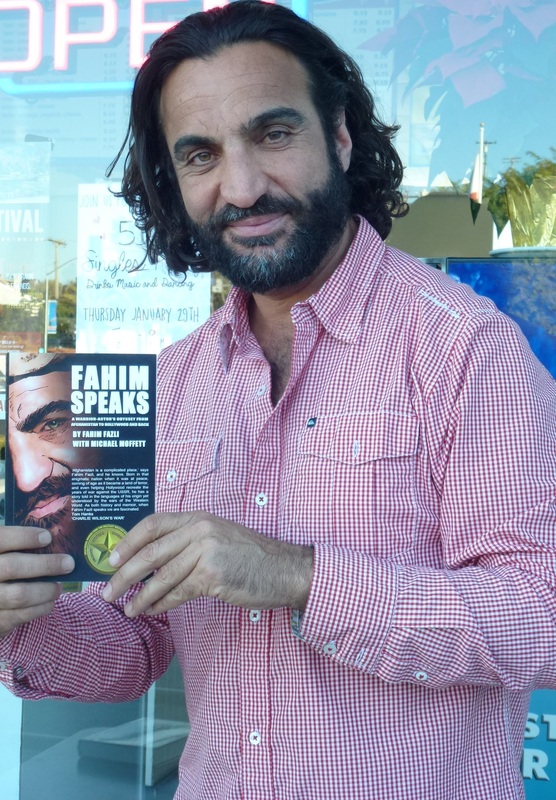 The book explains how Fahim eventually moved to Orange County and took acting classes, hoping to fulfill his childhood dream. He became a U.S. citizen. In 1996, Fahim met Amy, his future wife, at Las Brisas in Laguna Beach. A year later, they moved to an apartment in Dana Point. He was working for Nordstrom’s and at a mortgage company, and was getting movie work as an extra. While on vacation, he proposed to Amy on a ferry boat crossing the Straits of Gibraltar from Tangier to Spain. They married in Orange County. Three years later, they were blessed with a daughter Sophia, who now attends Dana Hills High School. He told me he has appeared in 60 movies and television shows, including Rambo III, Charlie Wilson’s War, Iron Man, and now, American Sniper. Fahim was so grateful for the opportunity to live in America, he wanted to give back to his adopted country and at the same time help his native country. He signed up to be an interpreter for the Marines and returned to Afghanistan in 2009 and 2010. He returned again in 2014. But when his agent called to say that he had a role in the Clint Eastwood movie, American Sniper, he resigned his position and returned to Dana Point. He has also completed his second book, which will be published soon. When the movie about Fahim’s life is made, we will have a movie star living in Dana Point. Thank you tom your the best.